I am on vacation! (I actually left on the 7th!) To quote J, "I'm on a boat!" (video nsfw). I'll be back on the 23rd! I just cleverly deleted the photos from my camera of the yarn I am using to make this. I spun a fine sock weight out of a pale indigo blue, madder red, and white in stipes and plied them back on each other (all naturally dyed by me). I purposely varied the length of the stripes so they wouldn't always overlap. There's about 250 yards of the handspun. The gray yarn is a vintage commercial fine 3 or 4 ply. No idea of the yardage, it is just in 50 gram balls, at least 200 yards a ball. The yarns are finer than dale baby ull- definitely candidates for the 8-9 stitches an inch! 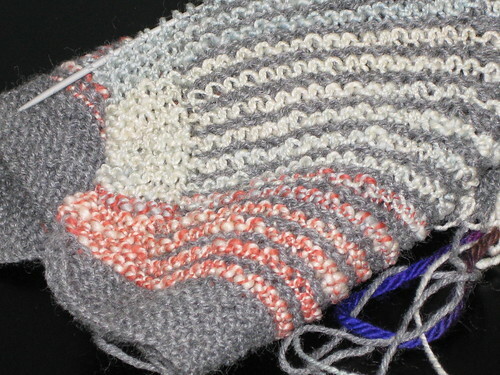 I am using size one needles, but if I were knitting socks I would ahve to go down to 000 (ok, who are we kidding, I would have to for more sock yarns, but still!). 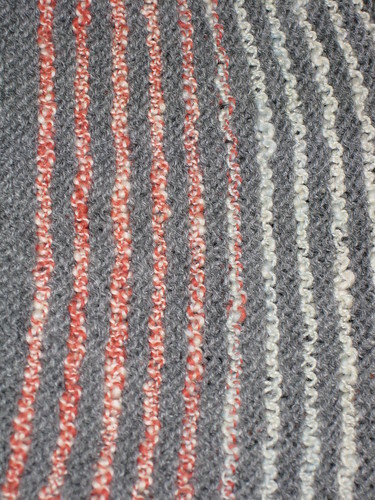 I am loving the short rows. Easy but still interesting. This takes longer than expected since I am using a very fine yarn. The pattern is a jacket pattern by Drops. 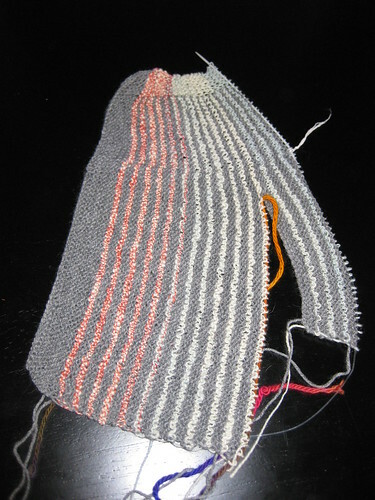 I cast on fewer stitches for the sleeves- finished versions I have seen had really long sleeves compared to the size. I will probably add edging in the gray all around the edges to make it look a bit more finished. I am looking forward to how the stripes will work up! I love seeing all the finished projects on Rav. that people have made. I was hoping mine would look a wee bit more refined, but o well, it is cute anyways. I think it would be pretty in colorways similar to what Hanne Falkenerg uses in her kits.